Macon, Georgia is home to the International Cherry Blossom Festival, which aims to spread the themes of "Love, Beauty, and International Friendship" to all who participate. It's really a beautiful festival that happens every year in March. Much like the Cherry Blossom Festival in Washington D.C. (and others around the world during the Spring), the Macon festival, however, has a little something special. Take all the international festivals and add a pinch of southern charm, and you've got the Macon Cherry Blossom festival. Every March, Macon turns into a cotton candy pink and white impressionist painting, when over 300,000 Yoshino cherry trees are in full bloom. The festival lasts 10 days, and it's hands-down one of the most breathtakingly vibrant flower festivals in the country, and even the world. According to the United States Congressional Records, Macon is officially the "Cherry Blossom Capital of the World." So, how did this charming, soul-filled town get such international acclaim? It goes back to 1949, when William A. Fickling Sr., a local realtor found a Yoshino cherry tree in his backyard, which is quite a rare tree to find in the southern U.S. No one knows where the tree came from, or how it got in his backyard. A few years later Fickling was in Washington D.C. on business when he saw the exact tree in the nation's capital. After returning back home Fickling started planting more Yoshino cherry trees and shared them with the good people of Macon. Macon's Yoshino cherry trees quickly began attracting the attention of nearby communities, and pretty soon national interest picked up as well. One person who was particularly enchanted with the cherry trees was Carolyn Crayton, a recent Macon resident who moved to the town in the 1970s. She met up with Fickling and spoke with him about a dream she had "where the entire town was bursting with thousands of the graceful pink cherry trees." Fickling agreed to donate cherry trees to her Wesleyan Woods neighborhood, and that became the start of the cherry tree takeover of Macon, Georgia. On Saturday, November 24th, 1973 500 Yoshino cherry trees were planted on Guerry Drive along the Wesleyan Woods. After the cherry trees were planted at Wesleyan Woods, Crayton proposed that the town host a Cherry Blossom Festival, to celebrate the beauty of the town's blossoming cherry trees. She also wanted to make sure Fickling received recognition for this tireless efforts and generous donations. 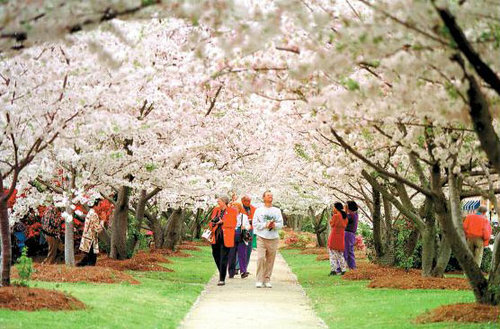 In 1982, the Cherry Blossom Festival was established. You can pay your respects to Fickling at the historic Riverside Cemetery, as well as visit the graves of Georgia's first lady o flight, and a former road manager for the Allman Brothers Band. The Macon Cherry Blossom Festival has become one of America's top festivals. It went from a three-day festival to month-long celebration. The Yoshino cherry trees are also growing in number, due in part to the Fickling Family Foundation, which has continued to donate thousands of trees to residents every year.